All the places we have been: TALONS Guitar Photoset on Flickr. There’s also some pics posted by others under the tag, TalonsGuitar. It’s fitting that two of the TALONS alumni that originally gave me the guitar pictured above are actually in Introduction to Guitar this semester. I’m glad that they’ll get to see some of the story of the TALONS guitar that they might not have been privy to in the last two and a half years of its life here in a post that hopefully gives you here an idea of some of the power of musical instruments as totems of community, of place and of the people that connect them to us. Which they are. Which they were. Since then the guitar has accompanied me and the ensuing TALONS classes everywhere; it is my and our “travel guitar.” Even if the action is a bit high, and it doesn’t hold its tuning perfectly, it is too pretty to only live indoors. And its story is too good to not introduce it to new people. 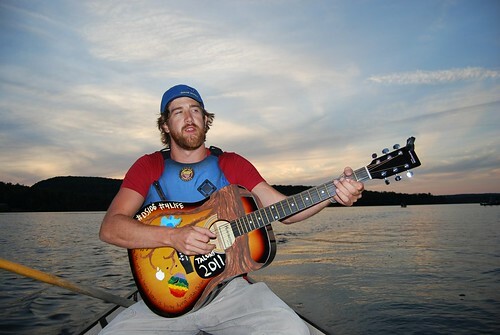 One of the first ventures the guitar got to take was back east and into Algonquin Park, at the inaugural Unplug’d Educational Summit. In feeling particularly blessed to be invited along to Unplug’d, where so many of my educational idols were going to be collected, I was proud to bring the class’ guitar to the event, as it has been through my working relationships with TALONS learners these last few years that any of these people would have ever heard of me. 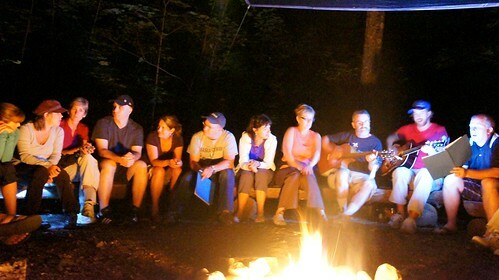 Sitting on the dock at the lake, singing Tragically Hip songs in the back of a canoe, and getting to lead a campfire singalong with forty educational leaders from across Canada was a supremely memorable experience, and one that the TALONS guitar played no small part in. Photo (again) courtesy of @Giuliaforsythe, who was also paddling the canoe. The gift of a musical instrument is actually a gift to all of the people that will ever hear it. What a thing to contemplate: that these objects are conduits for community, and connections between people. I started thinking – although I was only just starting – about what it meant to be someone who wielded one of these instruments, and how musicians can be vessels of sorts as well. 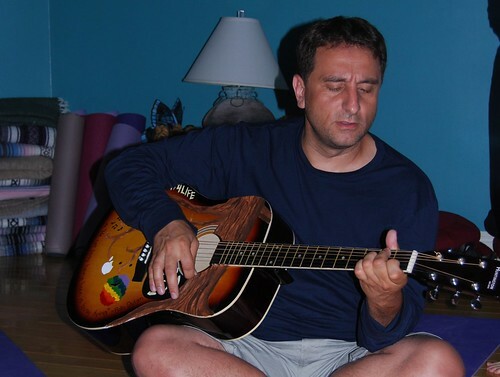 But more on that later… this is about the guitar, not me. Since then, I’m happy to report, the guitar has made it on plenty of TALONS trips – into the woods on the Sunshine Coast, to Squamish, Hicks Lake – and on a host of my own adventures – family vacations to Vancouver Island, camping on Galiano. It’s the guitar that seems to deserve to be taken on adventures, and played outside, and to acquire more stories. In its way it is its own entity: a magical and powerful object, and one I’m grateful to have encountered, and to keep encountering, every time I pick it up or hear it played. Thanks Clayton and Immy for introducing me to it! That’s wicked. I’ve seen the pics, and wondered about the artwork. What a great story.